A colour photograph of a public school in the Miniature Village at Cullen Gardens. This building is a replica of a public school built in 1892 in Tyrone, Ontario. The models in the Miniature Village were exact replicas built on a 1/12 scale. They included houses, churches, schools and shops modeled to represent a typical small town in Ontario. 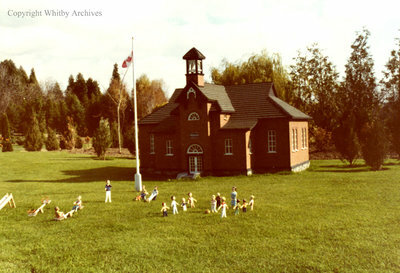 Public School in the Miniature Village, Date Unknown, Photographer Unknown. Whitby Archives A2013_042_179.